A horse in its teens may typically be thought of as “old”, but the reality is that the genetics of the individual, plus how it was cared for during its life, will dictate when the nutritional needs begin to shift from that of an adult mature horse to that of a geriatric horse. That point in life varies among horses and is a gradual process that doesn’t happen overnight. It is estimated that there are over 700,000 senior horses living in the United States today. There was a “horse baby boom” in the mid-to-late 1970s, making 9-11% of the total horse population today older horses. Many of these horses are well into their 20s or 30s, and still live very healthy, active lives due to better care and feeding. The best manner in which to care for older horses is to address their special needs prior to any significant decline in condition or health. As always, your veterinarian plays a key role in helping to ensure the continuing good health and longevity of your horse. Three main areas of attention needed for the older horse are nutrition, management, and health. Dental – Teeth that are worn or missing make chewing difficult for the horse. Poor dental care can also cause mouth ulcers resulting in pain. Poor teeth contribute to the horse not chewing its food long enough to produce the amount of saliva necessary for proper digestion. Saliva not only contains enzymes important for the digestion of feed, but it also helps to lubricate the esophagus for ease of swallowing. If a horse is dropping bits of feed or forage out of its mouth, chances are there is an underlying condition in the mouth. In addition, feeds that are processed and easy to chew will help the problem of dropping feed. Water can also be added to the feed to make a gruel which will be even more edible for the horse with poor dental condition. A horse can literally “drink” a meal if teeth are in extremely poor condition. Digestive System – As the horse ages, the motility of the digestive tract becomes compromised. One reason may be due to the fact that the horse itself has become less active. However, digestive concerns still can occur in those individuals that remain active, even as an older horse. Gas production and impactions can lead to colic symptoms. By feeding smaller meals more frequently, the horse can more easily digest and process its feed. Reducing starch or grain in the diet can be helpful in preventing excess gas and constipation. Increasing the amount of a high quality, easily digestible fiber source may also assist in this regard. As always, offer plenty of clean, fresh water to keep food moving through the system. Consider adding 2 ounces of salt to the horse’s diet to stimulate water consumption. Remember, horses prefer tepid water from 45 to 75 degrees Fahrenheit. As part of the aging process, the older horse experiences a reduction in digestive efficiency, along with a decline in its ability to absorb nutrients. By feeding a processed feed, as opposed to whole grains, and by fortifying the nutrient levels in that feed, the horse is better able to absorb those nutrients which are made available in its diet. Parasite infestation also hinders digestive capabilities, so a proper deworming and parasite control program must always remain paramount in proper maintenance and care of the horse at any age. Body Weight – Though some senior horses have a problem with being overweight, it is much more common to see older horses that have become too thin. Aging tends to result in a reduction of muscle mass, along with difficulty in maintaining adequate weight. As mentioned earlier, the older horse may not absorb nutrients as efficiently as it had been able to do in its younger years, or may be experiencing problems with chewing and digesting. Monitor horse’s body weight using the established Body Condition Scoring System, paying special attention to weight over the top line, back and rib cage areas. 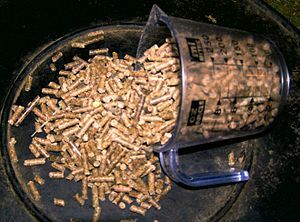 If your horse is too thin, feed a processed feed that contains high quality, easily digested protein and readily available energy. If the horse is too fat, minimize grain intake to control calories, yet still assure that proper protein, along with correct vitamin and mineral balance, is being maintained. Hair and Skin – An inadequate diet is often to blame for problems with hair, skin, and hooves in horses of all ages, but is especially evident in the older horse. Regular brushing and a good nutrition program will contribute greatly to resolving these conditions. Nutrients such as protein, essential fatty acids and vitamins are particularly important, and many times are inadequate in a typical diet. Poor hair coat in older horses can sometimes be due to Cushing’s disease. This is caused by a tumor in the pituitary gland. Symptoms of Cushing’s disease include long hair coats that shed late in the year or in patches, loss in muscle mass and excessive water intake. Consult your veterinarian if you feel your horse may be showing these symptoms. In a study of geriatric horses, over 70% of the horses over 20 years of age showed subclinical signs of pituitary or thyroid dysfunction. These dysfunctions can cause an intolerance to glucose or blood sugar. After a meal high in starch, such as cereal grains, blood levels of glucose and insulin become abnormally high. Horses with Cushing’s disease respond to diets that are lower in starch and higher in fat and fiber. With proper veterinary care and nutritional management, these horses can live for years after the appearance of the clinical signs. Bones and Joints – As horses become older, we begin to see lameness which may be due to chronic founder or laminitis, arthritis, or stiffness from weakened bones due to demineralization. The first course of action is to obtain veterinary assistance to aid in alleviating discomfort. Depending upon the specific condition, management recommendations may vary. Nutritionally speaking, it is important to provide a nutritionally balanced diet providing more calories from fat and fiber, as opposed to starch, along with a good mineral balance. Anemia – Anemia is a reduction in red blood cells and can occur in horses of any age for a variety of reasons. In the older horse, anemia may be the result of poor nutrient utilization, or a decrease in red blood cell production. It can also be associated with heavy infestation of parasites. By providing a palatable, easily digested and balanced feed, the horse will receive and utilize the nutrients essential to its good health. In some situations, an extra blood-building nutrient may be recommended by the veterinarian. In summary, our large population of older horses can continue to provide us with joy and entertainment for many, many years provided that we, as their caretakers, are aware of their changing needs and make certain that we do whatever we can to provide them with the best care possible in their golden years. Through proper nutrition, management and health care, we can help our older horses to continue to thrive for many years! This entry was posted on Saturday, March 24th, 2012 at 2:38 am	and is filed under Horse. You can follow any responses to this entry through the RSS 2.0 feed. You can leave a response, or trackback from your own site.